Geneva, creator of the increasingly outrageousS, M, L, XL, XXLrange of block-rocking all-in-ones has announced another "distinctive" speaker range. We love its balls. Which, in this case, are on sticks (or sit on your shelving), with multi-room functionality. So you can rock in a balls-out fashion in the kitchen, then slide through to the living room to practice your air guitar skills. 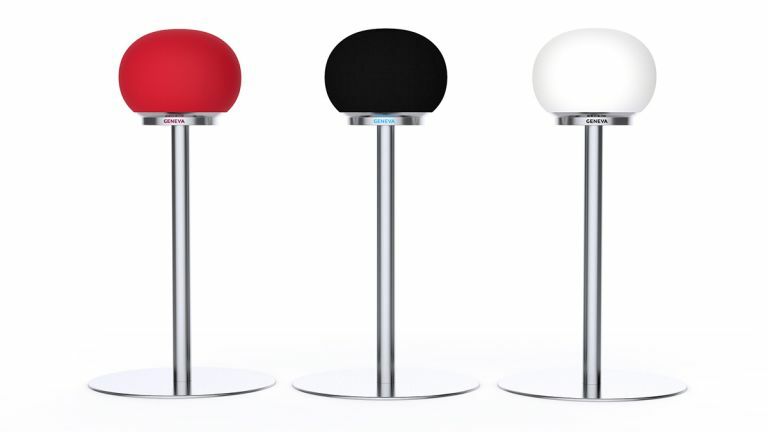 in a choice or red, white or black, the spherical design of these speakers would make a bold statement in any house. The multi-room tech used is Apple AirPlay but there's also Bluetooth (though that's one room at a time only), so you can stream music around the house from pretty much any device, controlling volume and track selection via the system's sleek metallic controller or the Geneva's own app. The mothership of the speaker range is actually deceptively small considering it houses two 1” tweeters, two woofers, and an up-firing 6” subwoofer, that's a lot of power behind your tunes, yet Geneva insists it still retains detailed audio production in music which is less bass driven. Designed for shelf or optional stand, AeroSphère 'Small' is a wireless active mono speaker which can be paired to operate in stereo through the AeroSphere App. Having the form factor of its larger range-mate but approximately half the size, AeroSphere 'Small' is conceived to extend spacious high quality sound to "bedrooms and dining areas" according to Geneva. You can buy the speakers as standalone units, but if you want the multi room connectivity you'll have to buy the base, an app-controlled network device which means you can multiply the sources available to as many as four. Pensioners will be pleased to know that the Base also supports CD and radio playback, so if you've still got a love for your old discs and the original form of "wireless", you'll be in clover.